Instantly create your password with a simple click. Is there a better alternative to PwdGen? Is PwdGen really the best app in System category? Will PwdGen work good on macOS 10.13.4? 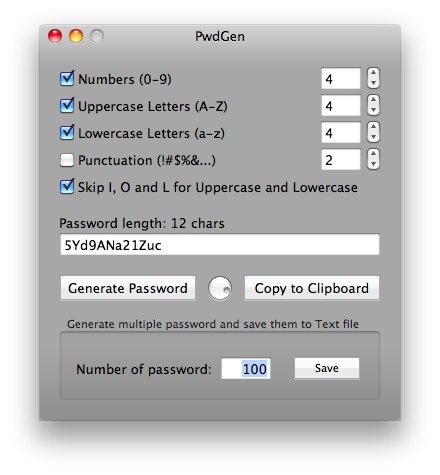 PwdGen lets you instantly create your password with a simple click. Just choose the length of password you want simply including the kind and number of chars (numbers, uppercase letters, lowercase letters...) then click on Generate password. You can also shuffle the generated password and copy it to the clipboard. PwdGen is a free tool for your Mac. PwdGen needs a rating. Be the first to rate this app and get the discussion started!